Using the six definitional criteria, evaluate the following definition. A square is a closed-plane figure whose sides are all equal. I do not believe that the right answer is offered as an option here. I believe that the definitional fallacy here is: "too wide". There are myriad polygons that could fit this definition besides the square. It should, in fact, be made narrower by including the parameter of having four sides or being a quadrilateral. First of all, the definition DOES NOT exclude polygons such as hexagons and equilateral triangles. Second, his statistic about other students' selections is not strong evidence and basically irrelevant, especially if the correct answer was unavailable. I really think that I am right on this one. Can anyone support my argument? Here is wikipedia's summary of fallacies of definition for help. I'm not sure what constitutes an answer to this question, exactly, but as a mathematician my professional opinion is that the given definition of a square is too wide. This is essentially a definition of an equilateral polygon, a very broad class of shapes which includes squares as well as rhombuses (diamond-shaped quadrilaterals), regular polygons, and many other types of polygons. As Ram Tobolski points out, the definition also refers to the "sides" of a figure, which really only makes sense if the figure is a polygon. So of the four answer choices provided, I think "unsuitable attribute" is most correct, since a general plane figure does not have the attribute of "sides". I'll try to demonstrate visually my point from the comments. I not only agree with the criticism of the definition by the OP, but I claim that the given definition is even wider, in that it covers not just perfect polygons. [A square is] a closed-plane figure whose sides are all equal. applies to the following figure, which is not a polygon. 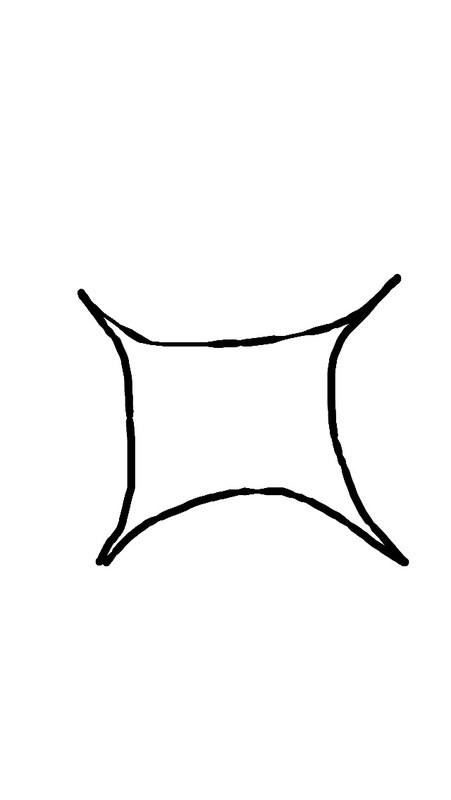 This figure is a closed-plane figure with four sides, all equal (trust me, they are equal :)). And it is not a polygon. I am sorry I have to side with your teacher, but the correct answer is 3. This conclusion is obtained by understanding the definition of "too narrow." And that is - if a definition excludes other possible members, then the definition is too narrow. You (correctly) argue that the definition excludes other members (polygons, etc.). Therefore you should have selected the 3rd answer - the definition is too narrow. Not the answer you're looking for? Browse other questions tagged logic philosophy-of-mathematics ontology philosophy-of-language terminology or ask your own question. What is the dimension of a curved plane? Are all fallacies created equal? What is the name of the fallacy characterized by “All A are B; therefore all B are A”? What underlying semantic notions connect the notion of 'thrown or hitting on both sides' to 'Amphiboly'?